Visitors to Katherine Mackey’s office on the third floor of Croul Hall may think they’ve wandered into a secluded wing of a botanical conservatory. A small wooden desk and an upholstered sofa are among the few pieces of furniture in this room dominated by a lush canopy of plants, all looking to be in spectacular health. The serene setting disguises the somewhat foreboding nature of Mackey’s work. Her persistent investigations into the biology and chemistry of Earth’s oceans has made the scientist a direct witness to the unfolding effects of global climate change. As evidence, Mackey points to the minute organisms that she finds most fascinating: marine phytoplankton. They are the base of the aquatic food chain, and while their numbers are vast, they’re quite sensitive to changes in temperature, currents and nutrient levels in the ocean. When sea surface temperatures rise as a result of global warming or El Nino, there is less upwelling of the nutrient-rich water that feeds these creatures. 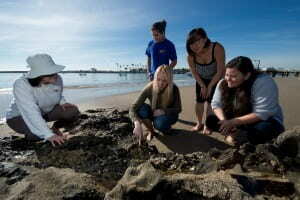 Mackey (center, kneeling) points out marine life to lab members (from left) Priya Ganguli, Johann Lopez, Luyi Ren and Belen Cairo at Corona del Mar State Beach. 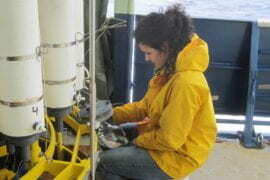 Samples collected on mid-oceanic expeditions or by Mackey’s students lowering containers from the Newport Pier are brought to her lab and examined under a microscope. Mackey tinkers with individual cells and studies how they create and use proteins in an effort to understand how planetwide forces are impacting the tiniest organisms in the sea. In a recent study, Mackey examined how plankton respond to different ratios of nitrogen and iron in mid-ocean and coastal waters when they’re forced to absorb large amounts of carbon deposited in the atmosphere by humans. Scientists have a good understanding of how human-caused acidification affects phytoplankton species such as Coccolithophores, which have calcium carbonate shells that can easily be liquified. But there’s increasing interest in acidification’s effect on a cyanobacteria strain called Synechococci, which Mackey knows well. Mackey, who lives in Irvine with her two sons, came to UCI in 2014. 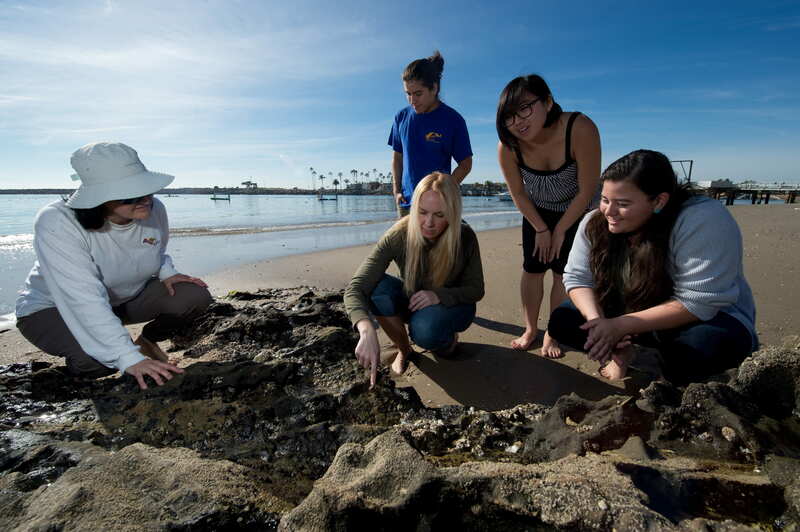 She’s already highly regarded in the Department of Earth System Science and a key member of the UCI OCEANS research and education initiative. 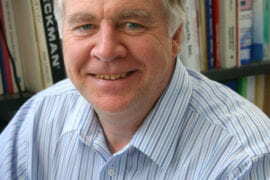 Prior to completing doctoral and master’s degrees in environmental engineering at Stanford University, Mackey earned bachelor’s degrees in botany and biological engineering at the University of Maryland. On an expedition to the Sea of Cortez between her freshman and sophomore years, she came into contact with oceanographers. Mackey hopes to impart some of that enthusiasm to the graduate students she mentors and the undergrads who attend her classes. She’s developing a new course, tentatively called Aquatic Field Methods, that will train students in the techniques and best practices she employs on her marine forays.